You and your staff at GoldenGirl Designs have obviously worked very hard. 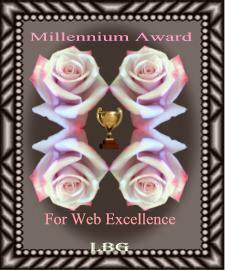 In recognition of creativity, integrity and excellence on the Web, "GoldenGirl Designs" has been reviewed and chosen to bear the 2002-2003 Golden Web Award. This award is presented to those sites whose web design, originality and content have achieved levels of excellence deserving of recognition. Your site has been chosen as a winner of the Webmasters Award Excellent Site Award! This is our highest rating. 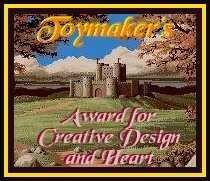 You have been awarded the "Toymaker Award"... This award has been presented to your site for Heart and Creative Design.. Your site review has been completed. Congratulations! Sites are judged based upon overall appearance, speed, navigation, use of technology and quality of content. We also take into consideration the amount of time and effort that goes into developing a web site and like to award your efforts. We found your site to offer our Internet community a great service. Again, Congratulations. Your designs are beautiful. I have made a number of porcelain dolls so I know what is involved in painting and making clothing for dolls. We toured your web site and feel that your site has met the criteria of our LBG® Web Award... Congratulations! Your site is very well thought out, informative, very navigable, and entertaining. Your Site has been listed @CyberTeddy500.com People's Choice WebSite500 and awarded CyberTeddy's Top 500 WebSite award. 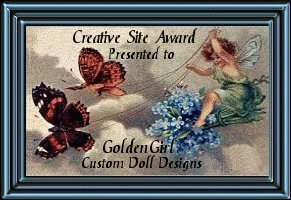 Your site "GoldenGirl Custom Doll Designs" has won the jps-web.com Site of the Day award for February 7, 2000!